Since 1871, Fairfield County Bank has been serving its community in scenic southwestern Connecticut. While the banking business has gone through innumerable changes over last 145 years, Fairfield County Bank continues its commitment to service that’s personal and efficient. When they needed an efficient reception solution for their human relations group, they turned to The Receptionist for iPad. Fairfield County Bank’s Human Resources department recently moved to the second floor of their main office. While this location is well suited for their team, there was one crucial piece missing, a receptionist. The Receptionist for iPad provided the perfect solution. 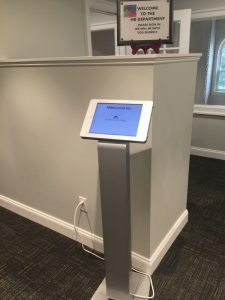 The digital receptionist allows visitors to sign in, alerting Fairfield County Bank’s human resources staff that someone has arrived. The staff is then able to provide the job candidate or vendor with instructions on how to proceed to their office. 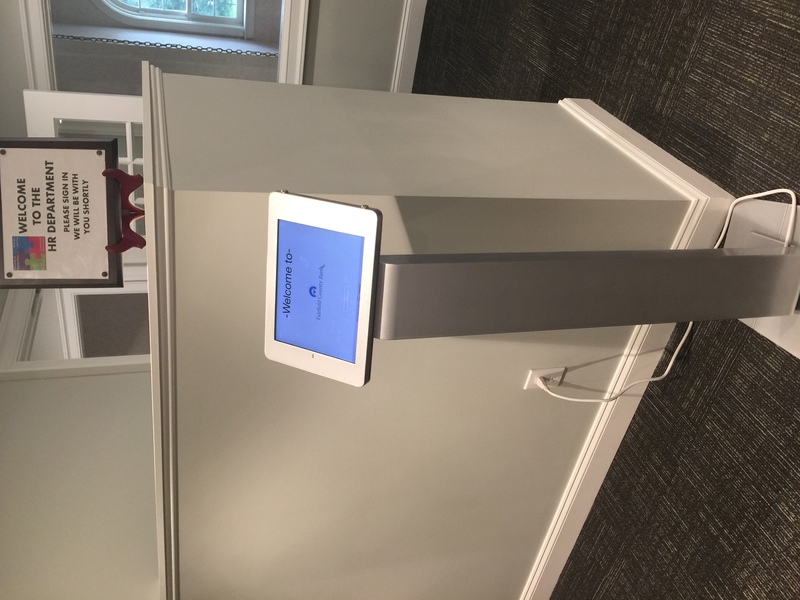 According to Vice President of Technology Brian Lynch, Fairfield County Bank chose The Receptionist for iPad as a way to both welcome visitors and make sure that the right staff person is notified to come out and meet them. “We put The Receptionist for iPad in the vestibule area,” Lynch explains. “When job candidates come in, we instruct them to take the elevator to the second floor, and then go over to the kiosk and enter their information. Then an HR staff member receives an alert.” Lynch has also set up a backup notification system. If the first staff member doesn’t respond to an alert within a certain timeframe, another notification automatically goes to a second person. This ensures that guests are received in a timely way. “We want every potential employee’s experience to be very positive,” Lynch says. “We don’t want them standing out there by themselves, waiting around, thinking no one’s coming for them.” The automated notifications have been a hit with both visitors and staff. “The HR team likes it,” Lynch says. “Because of the way their office is set up, before The Receptionist for iPad, it was very difficult for them to know when somebody had come in.” Lynch identifies two reasons he chose The Receptionist for iPad from among all of the visitor management systems: the straightforward set-up and the no-fuss free trial. “Being able to download it for free and try it was probably the number one reason why I went with The Receptionist for iPad,” Lynch says. “I downloaded it, and in 10 minutes I was already working on it.” It’s great to hear that our free trial is helping customers like Fairfield County Bank learn more about what we can do! Find out just how easy it is – start your free trial today. About Fairfield County Bank Fairfield County Bank is a $1.5 billion community bank founded in 1871 in Ridgefield, Connecticut. Through our 16 offices, Fairfield County Bank offers a broad range of products and services to the residents, businesses, and municipalities in Fairfield County, Connecticut. We are the recent recipient of the prestigious Bauer Financial Five-Star rating and the Warren Press “Fast 50” Commercial Lender Award. We have been the Top Ten Residential Lender in Connecticut for three consecutive years. We are committed to providing excellent service to our customers at every point of contact. We engage with our customers and continually exceed their expectations by having well trained professionals dedicated to our culture of service excellence. Fairfield County Bank invests in the communities we serve through business and residential loans. We actively participate in community support. We focus on our communities’ needs through extended employee volunteerism and corporate contributions. Our service offering is designed to provide ease of access wherever our clients choose; whether in a branch or at an offsite ATM location, online, on a mobile device, at a point-of-sale, or on the telephone. We are here, there and everywhere.